IWS was instrumental in helping us get the treatment plant designed and constructed in a very short period of time which enabled us to start selling houses as quickly as possible. DESCRIPTION: In November, 2015 Integrated Water Services (IWS) completed a turn-key design-build of the Crossings at Havenswood wastewater treatment plant for SouthStar Communities, a leading real estate development firm in Texas and the southeastern US. Located in Comal County Texas, the residential development is designed to treat wastewater for 182 single family homes at full build-out. IWS completed the design for all phases of the wastewater treatment facility and constructed phase I to serve the first 49 units. IWS’s design included a modular textile wastewater filter system designed to meet the effluent limits of the TCEQ “Permit to Discharge” that was obtained by M&S Engineering (www.msengr.com) of New Braunfels, TX. IWS worked with M&S to design the treatment system to accommodate the STEP (Septic Tank Effluent Pump) collection system that was being installed to service the residential community and was also designed by M&S. 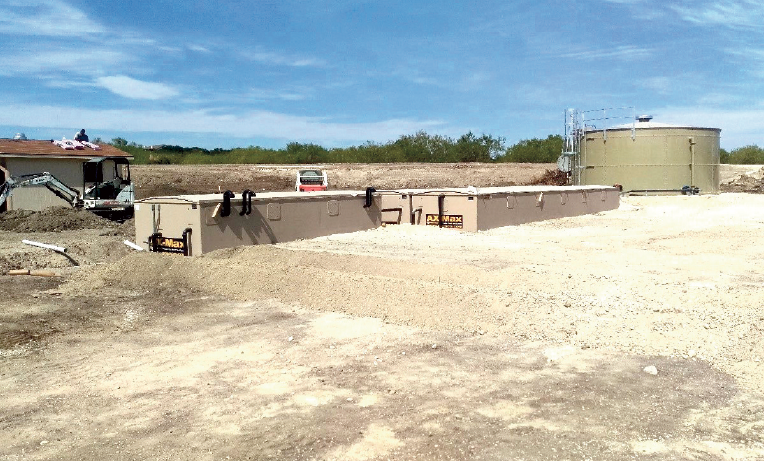 STEP collection utilizes a pressurized pumping system and shallow collection lines and is a very cost effective collection system alternative in the “Texas Hill Country” due to the exorbitant cost of installing conventional gravity collection lines and manholes in rocky, hilly terrain. Phase I of the treatment system is composed of two AX-Max textile filter units (www.orenco.com) followed by a liquid chlorine injection system, chlorine contact chamber, and effluent pump system. The system includes a 24’ diameter by 12’ high (40,000 gallon) storage tank to provide surge capacity and equalize peak flows. A level sensor and actuator valve controls the flow into the AX-Max system. A telemetry based control system was provided and installed to allow remote access and monitoring of the treatment system. Following treatment, the effluent is discharged to a creek under a TCEQ surface water discharge permit obtained by M&S. A control building, designed by M&S, is also a part of the overall treatment plant. IWS worked collaboratively with M&S Engineering and SouthStar Communities in order to implement the project in as short a time frame as possible. IWS’ scope of work for design and construction was completed in less than 6 months. Jim Vater, VP of Planning and Development of South Star Communities, appreciated IWS effort, “IWS was instrumental in helping us get the treatment plant designed and constructed in a very short period of time which enabled us to start selling houses as quickly as possible”.